Our return to Cancun began so fortuitously, could we really be in for smooth sailing the whole trip? Let’s find out on our first full day in Cancun, when Lidia decided to give us a proper Mexican barbecue. Saturday turned out to be beautiful: the clouds rolled away and the sun came out, the humidity rose, and it was a perfect day for a pool party Lidia was kind enough to host at her apartment. After breakfast on the patio and a quick dip in the ocean that morning, eight of us piled into taxis to get to Lidia’s place where we were greeted by Lidia, her boyfriend, and one of her students, who’d agreed to grill for us that day and help out at the party. Good thing too – judging by the full keg of beer and multiple bottles of tequila and vodka people brought. No one in that group should be trusted around open flames. We drank, we ate some of the best-grilled cactus and corn ever, we waded around and swam in the pool, we ate some more, we drank some more. Lather, rinse, repeat. Finally, about 10 that night everyone was swum out, though naturally not done partying. So where does one go in Cancun for a nightcap? Why, the local pub of course! We ended up at The Black Pub with giant pints of beer, a DJ in a British phone booth, and terrible 80s music videos playing on TV (I’d forgotten how bad the hair was back then!). After another round of drinks, and our friend Dirk fully living up to his nickname of “Dancin’ Dirk,” some of the group had their second wind and wanted to hit the giant Jacuzzi back at the hotel. Lidia was such a fantastic hostess during our stay. The barbecue was probably the best food we had the whole time we were in Cancun. Photo courtesy of: Adam Jones-Kelley. Remember those silly pictures I mentioned? This is one of them. Sill photo courtesy of: Dancin’ Dirk. Unsurprisingly by the time we arrived back at the marina, close to 7 that night, everyone was pretty well wiped out for the day. The only thing on my mind was to get in a hot shower and wash the layer of salt and sunscreen off. At least I wore enough sunscreen this time, unlike my first outing in Cancun! We reconvened at the hotel an hour later, freshened up and walked across the street to the large outdoor mall on the lagoon. 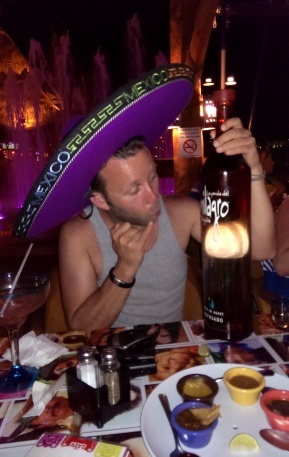 Complimentary tequila shots and a giant bottle of tequila plus matching sombrero, created some memorable photos, capping off a relaxing dinner with the group. After dinner, Sean and I went for a nighttime stroll along the beach and saw the most amazing sight. Once again, we saw no less than five or six giant sea turtles emerge from the ocean, lay their eggs, and head right back into the surf. I’d seen the turtle imprints in the sand during the day, and the turtle nests cordoned off along the beach to keep them safe, but I’d never seen it actually happen. It’s hard to describe just how awesome it was to watch this happening so close, but it really was. I feel so lucky to have been there to witness this miracle of nature. When we returned to the hotel room that night, I thought we were scott free. We’d actually beat the system and a smooth vacation from beginning to end – no major hiccups. And with this naive, self-satisfied thought, I totally jinxed us. Want to know how? Read my next blog to find out how. 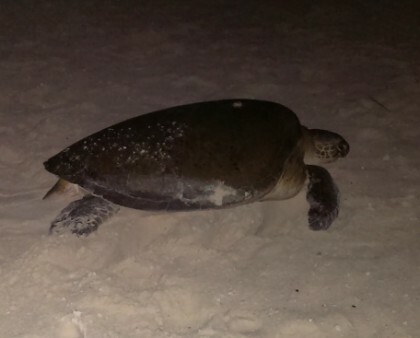 One of about ten sea turtles we saw during multiple walks on the beach after the sun went down. Such a cool experience. Photo courtesy of: Dancin’ Dirk. 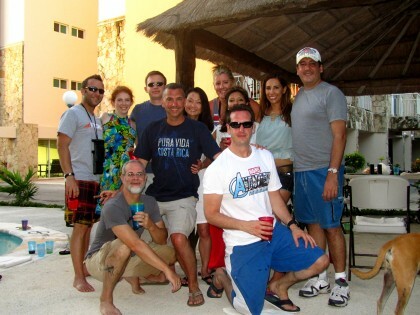 This entry was posted in Mexico, North America and tagged barbecue, Beach, Boat, Cancun, Dance, Isla Mujeres, Mexico, North America, Pool, Sea turtle, Tequila, Travels on June 20, 2014 by Paige N.. It was so much fun. I highly, highly recommend it!